At Trois Rivieres Botanica & Store in Little Haiti, you can find a wide array of true implements to Roman Catholic religious practice, folk medicines and other products considered as alternative medicines or items with magical healing power for many common and incurable diseases that are not regarded as orthodox by the medical profession. We also stocks products associated with less common spiritual practices such as, Candomblé (Afro-Brazilian religion), Curanderismo (traditional Native American healer), Macumba (African Bantu origin), Espiritismo (Latin American and Caribbean belief) and Santería (religion of West African and Caribbean origin). Few of the interesting items you can find at Trois Rivieres Botanica & Store include: cleansing baths, oils, perfumes and blessed personally with fresh flowers and plants, amulets, religious candles and statuary, incense, perfumes, scented sprays with special properties, images of saints, rosary beads, holy water, tools for Palo, Ocha, and Ifa ceremony and many others. The motto of Botanica is to secure customers through competitive pricing and retain them through happy and satisfied long lasting relationships. 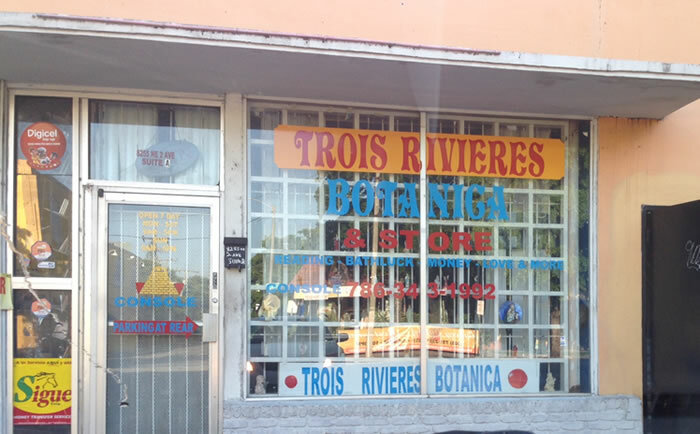 Although, the name Trois Rivieres Botanica suggests "botany" or "plant" store, referring to some establishment that functions as a dispensary of medicinal herbs which are sold dried or fresh, prepackaged or in bulk, this shop in addition to that serves as a unique site for the performance of religious culture. You can find great collections of "religious apparel", the articles which are worn as part of the observance of some religious faith and items to be used with subject to some limitations based on mission or other requirements under situation special or important to you, or you can give them as the perfect gift to someone you care.